Congratulations to Mary Lou Keller! You are the winner! If you could please email me your complete mailing address and phone number, you will receive your prize soon! NOTE: Chosen Foods has graciously offered to provide a 500 mL bottle of their avocado oil to one lucky reader. For a chance to win, simply comment below before 6:00 pm EDT on Wednesday, October 2, 2013. The lucky winner will have 48 hours to respond with a complete mailing address. Good luck! You know how people say that you shouldn’t cook with a wine you wouldn’t want to drink? I have decided the same should hold true for cooking oils! Since I write about food and develop recipes on a daily basis, if I realize there is a mainstream or up-and-coming food I have not tried, I make a point of fixing that. A while back, I entered the world of millet and was pleasantly surprised. More recently, as I learned about the health and cooking benefits of avocado oil, I began experimenting with it as well. If you try avocado oil, use it wherever you would olive oil or vegetable oil. It may be used in baking as well as stovetop cooking, offering excellent moisture and flavor. Basic vinaigrettes allow the full-bodied avocado oil to truly shine. The following recipe is one that I look forward to every fall, when freshly picked beets are plentiful at our local farmers markets. One of my favorite salads (click here for the recipe) pairs roasted beets with a simple yet sublime combination of nuts, cheese, and greens. Tossed with the following dressing, this salad becomes a hearty, healthy, satisfying meal. This dressing has a thick, luscious texture that belies its simplicity. Avocado oil is a flavorful substitution to the more frequently used olive oil and is a perfect match to the flavor of orange. 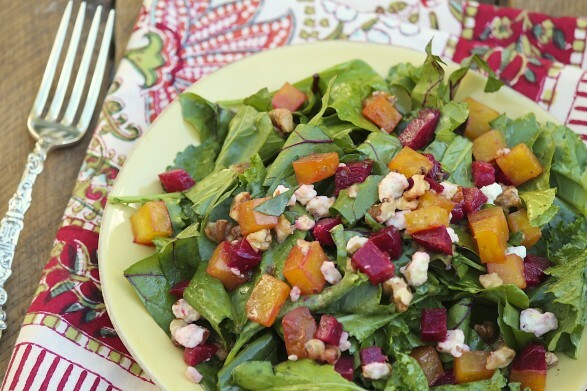 We enjoy the vinaigrette on a variety of salads incorporating beets, yet this particular citrus flavor pairs equally well with orange vegetables like butternut squash, sweet potatoes, and carrots. Yields 1 1/3 cup (recipe may easily be halved). Allow the orange juice concentrate to sit on the counter long enough that you can scoop out the desired amount. It does not have to be completely thawed. Whisk together the avocado oil, balsamic vinegar, honey, salt and pepper in a small bowl or jar. Add the orange juice concentrate and whisk until throughly combined and emulsified. If using a jar, you may screw the lid on tightly and shake well. Store in the refrigerator. Dressing will keep for a week or more. 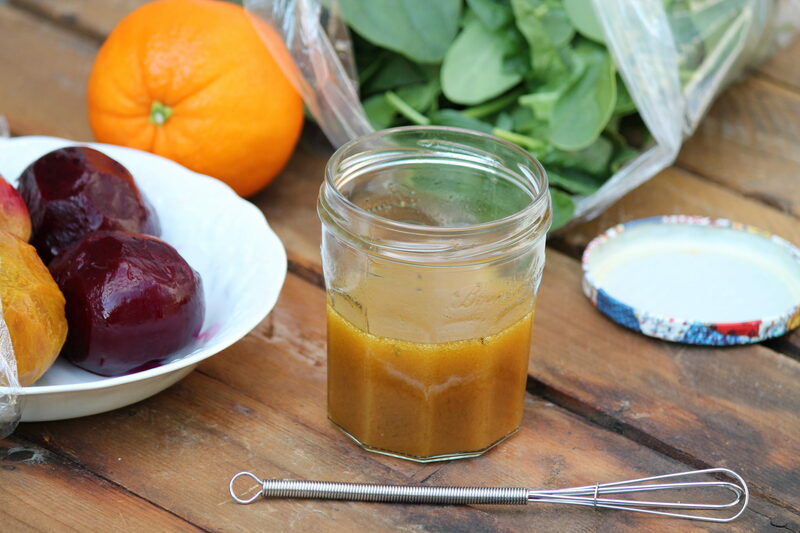 I have also made a stripped-down version of this vinaigrette, using only the first three ingredients. While that version is delicious, too, and you may wish to try it, the honey and seasonings round out the flavors nicely. You can refreeze the orange juice concentrate for later use. 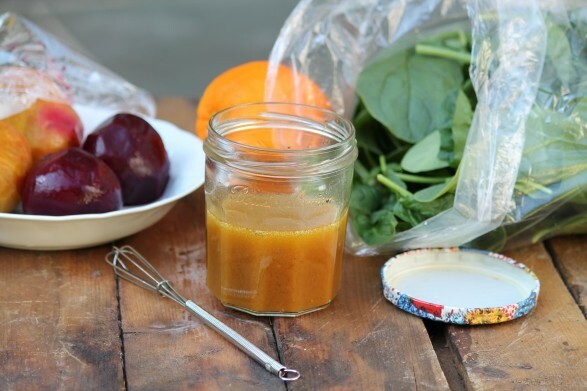 I have made this recipe with regular orange juice and, while tasty, the concentrate creates a thicker, more flavorful dressing that emulsifies beautifully. Avocado oil can safely be used to sear, BBQ, stir-fry, deep-fry, roast or bake. And because of its mild, nutty flavor its the perfect oil for salad dressing and sauce, too. If you are interested in additional information on avocado oil, click on this link to Chosen Foods, the brand I use regularly. If interested in trying, the oil is widely available at Costco and may also be purchased through the above link. This is the first I’ve heard of Avocado Oil! Nice! Avocado Oil. . Can’t wait to make my vinaigrette’ s and fry my chicken (the only thing I fry anymore) well, maybe fried green tomatoes and fried apricot pies …Yumo! Sign me up! And the vinaigrette recipe looks awesome! I would love to win this oil!!!! First I’ve heard of Avacado oil. Would LOVE to try it!!! The recipe looks amazing. I’ve never heard of avocado oil, but it sounds yummy! What’s funny is I was just looking at the avocado oil in the grocery store and thinking hhmmm…..what should I make with this. Thanks! I will try it. I would love to win avocado oil. I”ve never tried avocado oil. I love avo & orange salads, though. I’d love to try this dressing on it. Thanks for the recipe and information….I have never heard of avocado oil, but now will definitely try it! Love avocados but have never tried avocado oil. Looks & sounds delish! Would love to try some, always looking for new good adventures. i just got into experimenting with cooking so this would come in handy! Omigosh, avocado oil?? That sounds amazing! Avocados are among my all-time favorite foods — so delicious and healthful — and I just know that the oil would be fantastic too. Would really love to try this oil! I’ve gotta try avacado oil!!!! Yummmm! I love Avocado’s! I would love to try this oil. I can just taste it on a plate of sliced tomatoes with sliced garlic, a wee bit of salt and drizzled with Avocado oil. Yum! Never heard of avocado oil before, but would definitely use if it is good. Would love to share this with new oil with friends & family. Always looking for heart healthy foods and oils. Never tried this but, would love too! I have never heard of avocado oil but would love to try it on a salad and even in my hair. Might even try cooking with it. Love trying new healthy choices and ideas. Thanks in advance. I never even knew there was avacado oil!!! Would live to try it!! Awesome! It’s hard to find where I live. Never tired avacado oil but I bet it is good!…Love to win! I was not aware of this and can’t wait to try it! I hope to win this so I can try it soon. I am always interested in new heart healthy ingredients. I’VE ONLY HEARD OF OLIVE OIL BUT I’D BE INTERESTED IN TRYING AVOCADO OIL…WHERE WOULD I FIND IT? This particular brand is available at Costco, Sonja! Love avocados, would love to try this. Thanks for this opportunity. would love to try it!! I have been looking to try a good quality, safe avocado oil. I have wondered if it would be good in salad dressings. I can’t wait to try this! Thank you for a chance. Awesome something I love is Avocados now i can cook and be healthy. I love the high smoke point and healthy aspect of this oil. I’ve used avocado oil in my hair but it never occurred to me that I could cook with it! I’ll be trying this vinaigrette recipe soon. Thanks! Avocados are so good, I want to eat them on everything! Avocado oil makes that even easier to do! Yay! Recipe looks amazing! Delicious & healthy~ A WIN-WIN! Would love to try it 🙂 I love avocados so I imagine I would love this too! I will be glad to give this oil a good try. I would love to try Avocado oil, I’ve heard of and used many different oils but haven’t heard of nor tried Avocado oil. It would be interesting to try it in dressings and using it as a substitute in my baking applications calling for vegetable oil! Would be grateful to win! Sounds yummy! I’d love to try the avocado oil! Would love to win, I had not heard of avocado oil. This dressing is exactly what I’ve been looking for. It sounds like something I had in a Japanese restaurant on its salad dish. My friend was raving about it and I will share this recipe with her. I have not used avocado oil personally and this might be my lucky day to give it a try!! Hope I win the prize…. I would be interested in trying this…fingers are crossed! Perfect recipe for October NO Processed Foods pledge! I’ve not seen Avocado Oil in our local stores. I am looking for an oil that I can use in sauteing, cooking and baking. I use Extra Virgin Olive Oil for a lot of my cooking but not baking. I’ve quit using, Canola and Safflower because of the GMO factors. I would love to win a bottle to try it !!! I have never heard of avocado oil until now. Thank you for posting the smoke points. I have been using olive oil for everything, including frying & sauteing, which sets the smoke alarm off regularly. This is a must try! I adore avocados! I eat them with lots of things and also just slice them open and eat them with a spoon. I dont believe i have ever heard of avocado oil but i would love trying it! We quit using veg oil years ago and dont care for olive or peanut oil. I bet this is delicious! And the recipe sounds fabulous!! Will look for this also at Organic Market! Would love to win a bottle to be able to try it! I have been wanting to try this! I want to thank you for hooking me up with the link to this avocado oil! I just love the stuff and haven’t been able to find it in Lancaster . . . . last time I checked at Costco they didn’t have it, so I didn’t look again. I use avocado oil for cooking & drizzle it on my salad. would LOVE to try this! I am looking into healthier living, and have heard this is a good option. Healthier living with Avocado Oil! Would love have to have this!! I would love to win a bottle of the Avocado Oil, I love anything Avocado, just moved to Florida like 3 months ago and have been more conscience of what I am eating & trying to lose weight & so far I am now doen 31 lbs. Avocado Oil sounds so interesting! Would love to give it a try. Maybe it would even lube the old knees! So much good press has been given to avocadoes, so progressing to avocado oil is not only natural but healthy as well. Plus, I like the switch from other oils whose provenance is questionable. Interesting combination. I would love to try this. I never cooked with avocado oil, but its smoke points makes it VERY interesting. Pick me, pick me!!! Sounds wonderful! I love avocados, and eat 1/2 each day with lunch. This would be a great change from EVOO, which I love, too! Have never used this but would love to try! Yummy. Love all your recipes so trust this would be wonderful too! I love that Costco has healthy stuff like this – gotta check to see if we have it here in Canada Costco!! I really like avocadoes. I’m sure your oil is also delicious. I never even knew that avocado oil existed–would love to try cooking with it. It’s always lovely to hear what foods you should eat more of for health (rather than foods to avoid)! Thanks for sharing this info! I would love to win this amazing avocado oil!!!! I have been wanting to try this blended with olive oil in my mayo recipe. Yum!!!! This salad dressing recipe sounds delicious and somewhat exotic. I’m always looking for a salad dressing that is different and since I’ve never used Avocado oil, I would be delighted to win a bottle. I would love to try this avocado oil. I can’t wait to try this and share with my daughter’s and their families. Guac rocks but a healthy salad should always be fashionably dressed in avocado oil with a tangy touch of orange. This is definitely avoca-DO – and fatty, artificially sweetened salad dressing are avoca-DON’T. I live in Texas, where can I purchase this? I love Avocados and this sounds great. I love to try it. As far as I have been told, most Costco’s are carrying this brand now, Mary. Hope you can find it! I would love to win this!!!!! I’m obsessed with avocadoes!! I eat like 4 every day!!!! I’m really into trying new oils and love avocado! I would love to win a bottle! I will be sure to let you know when I use the avocado oil too. I love avocados. Would love to try…been too expensive for us to “test” so far. Waited for reviews…what better than to review it ourselves! This is my first experience with The Fountain Avenue Kitchen. A friend on fb sent the link. Can’t wait to try the recipe on Pumpkin Muffins. Would love to try this avocado oil, sound wonderful. Welcome, Lisa! Hope you enjoy the muffins and find a few other recipes to try as well! Hope to try some,where can you get it? Ann thank you so much! I’m so thrilled to try this.. Doing a little happy dance..
Again, thank you Ann for this terrific opportunity to try something new! I am thrilled that big bottle arrived and know you will enjoy it. Thank you for letting me know, Mary Lou! Ann, they now have Avocado Oil at Costco! It was only $7.99. Same brand. I did not buy it, although I am thinking about it. I would love to know exactly what you use it for. Thank you for the great information, including the great price! I have been using this oil for some time exactly as I use olive oil. As of yet, I have found nothing for which I would use olive oil for which I wouldn’t use avocado oil. If you have any specific questions that I didn’t address, feel free to ask. Yum. I love avocados! Would love to try this! I also love your site. Thank you! I love avocados, too…and thanks so much!! I have just discovered avocado oil. I made a vinaigrette with 2 parts avocado oil, 1 part balsamic vinegar, about 6 grape tomatoes, and some salt. I whipped it together in my Ninja blender and it tastes so good!!! I love your tomato vinaigrette, and I bet it’s extra delicious with the avocado oil. Thanks for the great suggestion, Pamela! I’d never even consider using canola oil. We learned that Day 1 in my Holistic Nutrition MS. I would squeeze my own fresh orange juice instead of using the frozen concentrate. I’d love to try Chosen Foods Avo Oil. I do love avocado oil as an option, Suzanne, and I bet freshly squeezed orange juice would be perfect.